Location: Ft. Lauderdale, FL – No relocation assistance. Candidates must have proper work authorization to work in the USA. THIS IS A GREAT OPPORTUNITY FOR SOMEONE IN THE INSURANCE INDUSTRY LOOKING TO GET INTO THE BUSINESS CONTINUITY PROFESSION!!!!! *****Seeking candidates with 7 years expertise in insurance coupled with minimal business continuity expertise. The main focus of this position will be to provide support for the management of company’s insurance programs, as well as serve as a backup and support for the company’s business continuity and critical incident planning. Also responsible for risk identification and analysis to support the business units of the organization. • Build relationships and communicate across all levels of the organization to further understanding of Company’s insurable risks, crisis risks, business continuity plans, risk mitigation processes and critical incident plans. • 7+ years insurance coverage experience with a preference to property insurance knowledge. To apply to this position please visit http://www.bcmanagement.com/search-jobs.html and enter the job number 2542. We forgot to remind everyone that this special offer was expiring, so you get one more day to take advantage!!! Obtain data customized to your organization (industry, revenues, company employees, etc) to better understand how your peers are managing their business continuity programs. Or you can choose to assess your compensation compared to your peers within the profession (data customized to job title, geography, years of experience, etc.). Send us an email at info@bcmanagement.com to inquire or view our available reports at http://www.bcmanagement.com/holiday-offer.html. BC Management is offering you 40% off all BCM Research Reporting for one more day - EXPIRES FEBRUARY 1ST. - . An additional 10% off will be extended to those who are active members of the ACP and NEDRIX or who are certified through the BCI, DRI International and ICOR. See Available Reports - http://www.bcmanagement.com/holiday-offer.html. · BCM Compensation Report - Just published January 6, 2012. Salary: $130,000-$140,000. Bonus eligible and excellent benefit package. Degree: Bachelors Degree or Equivalent required. - Designs and implements accurate and thorough BCM risk assessments and impact analyses; and integrates this work into enterprise-wide risk assessments. - Coordinates the development and maintenance of crisis management, business continuity, and technology recovery plans throughout the client. - Exercises and tests developed plans and strategies against high risk scenarios affecting the client. - Manages timely and effective closure of identified issues. - Trains and coaches senior management, recovery teams, resumption teams, and the general employee population about respective business resumption roles and responsibilities. - Defines and implements relevant policies and procedures that facilitate an effective global business continuity program. - Designs and maintains self-assessments to maintain program competencies and identifies deficiencies; and leads BCM through internal audits, regulatory exams, and compliance reviews. - Represents BCM program needs, responsibilities, challenges, and the clients overall readiness and concerns to senior leadership, peers, and staff. - Designs and evolves the clients BCM program to integrate into the clients daily operations, and maintains that integration in swiftly evolving needs, using tools, procedures, relationships, and other techniques. -8 + years providing professional, specialized skills, including, but not limited to, business continuity planning, project management, disaster recovery planning, risk analysis and problem resolution. -Proven experience and ability to effectively lead a Business Continuity Program for a global bank, communicate with senior management, peers, or auditors, regulatory examiners and clients. attitude; flexible; adjusts well to change; complies with company standards/policies/procedures; displays professionalism. reference Job Order # 2541. For questions, please contact Alicia Stevens at astevens@bcmanagement.com. Canada BCM Compensation Report will not be published until August 2012. A BCM Compensation report was recently published for the USA too. Read an excerpt of this 50+ page report. How to use the BCM Compensation Report (40+ pages)? Evaluate how your credentials/ expertise compare to your peers. For example, what percent of respondents are certified and degreed? What percent of respondents are leaders in the profession in regards to publishing, public speaking, and serving on an association board? Quite simply... what's the competition? Assess the trending of skill sets, specifically with certifications and advanced education in the profession. Identify the skills needed toobtain your career goals and increase your earning potential. Determine where your experience lines up in each data chart. Average these compensation findings from all the data charts based on your level of expertise. If you’re a certified VP managing a global program with 15 years of experience, then you should expect to be earning more than the average total compensation for all business continuity professionals, which is $87,874 CAD (based in the Canada). Be competitive with your compensations to retain your current staff and/or determine the proper compensation levels to attract new hires. You may still purchase the report if you did not complete our 10th Annual BCM Study. This report is discounted up to 50% until January 31st with our holiday offer. Standard retail price is $150. View BCM Program Management Data Research/ Metrics reports also available. How does your BC program account for facilities outside your existing location? How do you manage recovery efforts across the world without the appropriate personnel? 1) Manage the BC program from the primary corporate office with periodic travel to other office locations. Upwards of 40% of respondents regardless of the size of the organization up to 5,000 offices. 2) Manage the BC Program with existing resources that are not experienced in business continuity/ disaster recovery planning. Usually upwards of 25% regardless of the size of the organization up to 5,000 offices. Those study respondents with 5,000 + offices indicated a more evenly distribution across the study selection options. These larger organizations are more likely to either place an expatriate (13%) or hire a full-time, permanent professional local to the office (25%). 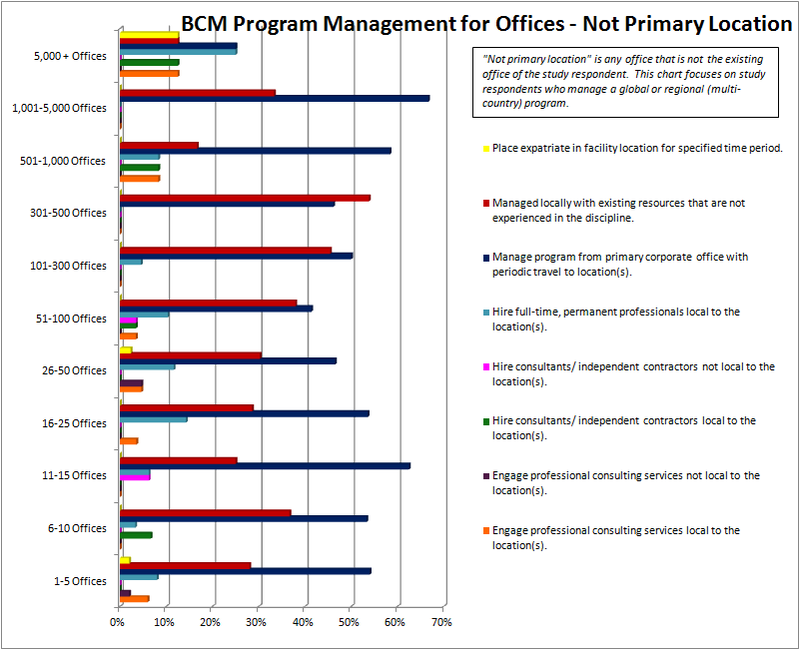 View BC Management data findings - http://www.weebly.com/uploads/3/7/5/2/3752086/bcm-non_primary_offices_image.png. This data chart only focuses on those study respondents who either manage a global program or who manage a regional program with multiple countries. Position: Senior Consultant – Enterprise Resiliency – Multiple Openings!!! Location: San Francisco, CA, Huntington Beach, CA, Chicago, IL, Dallas, TX, Houston, TX, Atlanta, GA, Philadelphia, PA, Jersey City, NJ or Norwalk, CT – No Relocation Assistance. Travel: 75% - regionally based practice, but may travel nationally if needed. *****Candidates must have 5+ years expertise in business continuity, IT resiliency or risk management coupled with a Bachelor’s Degree. Only candidates with previous 3rd party consulting experience (i.e. working with a Big 5 organization (KPMG, Accenture, PWC, etc) or a technology consulting organization (HP, IBM, EMC, etc)) will be considered. In this role you will be an Enterprise Resiliency Senior Consultant within the Consulting Services business unit of our client company. You will primarily be responsible for project delivery within the Enterprise Resiliency Practice. The Enterprise Resiliency Service Line “Horizontal” will work closely with the Industry Sectors “Verticals”. The Industry Verticals will provide the industry depth and knowledge. Your role is to develop and grow the Service Line Practice through delivering the Service Line Solutions across the Industry Sectors “Verticals”. o Work closely with a project manager or team lead to develop solutions in your Service Line. o Support business development activities as needed. o Junior Technical or Business Analyst. To apply to this position please visit http://www.bcmanagement.com/search-jobs.html and enter the job number 2538. Position: Consultant – Enterprise Resiliency – Multiple Openings!!! *****Candidates must have 2+ years expertise in business continuity, IT resiliency or risk management coupled with a Bachelor’s Degree. Preference will be given to candidates who have previous 3rd party consulting experience (i.e. working with a Big 5 organization (KPMG, Accenture, PWC, etc) or a technology consulting organization (HP, IBM, EMC, etc)). In this role you will be an Enterprise Resiliency Line Consultant within the Consulting Services business unit of our client company. You will primarily be responsible for project delivery within the Enterprise Resiliency Practice. The Enterprise Resiliency Service Line “Horizontal” will work closely with the Industry Sectors “Verticals”. The Industry Verticals will provide the industry depth and knowledge. Your role is to develop and grow the Service Line Practice through delivering the Service Line Solutions across the Industry Sectors “Verticals”. Physical Demands - The Consultant will spend long hours sitting and using office equipment and computers. He/she must be able to think strategically and will also have to scope and deliver presentations in front of groups of people. Environmental Conditions - The incumbent is located in a busy, open area office. The incumbent is faced with constant interruptions and must meet with others on a regular basis. Sensory Demands - The incumbent must spend long hours in intense concentration. The incumbent must also spend long hours on the computer entering information which requires attention to detail and high levels of accuracy. Mental Demands - There are a number of deadlines associated with this position. The incumbent must also deal with a wide variety of people on various issues. To apply to this position please visit http://www.bcmanagement.com/search-jobs.html and enter the job number 2537. Salary: $90-$115. DOE and location. Position is bonus eligible. Thorough knowledge and understanding of how to lead or facilitate relevant project management or client consultations in the areas of Risk Management. Thorough understanding of security analysis and risk management principals, security planning and compliance requirements, continuity of operations planning, and/or emergency response and recovery planning and operations. Thorough knowledge of assessing the effectiveness of a client's overall model risk management programs, including the effectiveness of internal controls to mitigate key model risks and offer process improvement. • Considerable experience identifying and addressing client needs: building, maintaining, and utilizing networks of client relationships and community involvement; communicating value propositions; managing resource requirements, project workflow, budgets, billing and collections; and preparing and/or coordinating complex written and verbal materials. • Considerable experience as a team leader: supervising teams to create an atmosphere of trust; seeking diverse views to encourage improvement and innovation; and coaching staff including providing timely meaningful written and verbal feedback. • Minimum Years of Experience Necessary: 6+ consulting in a professional services environment. • Minimum Degree(s) and Certification(s) required: Proof of degree and certification may be required. • Bachelor of Science or Bachelor of Arts degree required. Preferred majors: Business Management or Criminal Justice. Graduate level degree preferred (i.e. Juris Doctor, Masters in Business Administration). - Performed multiple Business Impact Assessment (BIA) projects including created company-specific criticality and impact assessment criteria, identifying relevant BIA functional respondents, developed / deployed BIA user questionnaires, facilitated BIA requirement working sessions, identified departmental operational dependencies consolidated departmental BIA results, and created detail reports and executive BIA presentations. - Developed several recovery strategies for the critical business functions, created an overall summary of recovery strategy options for the organization, identified alternative risk mitigation and recovery strategies based on management’s conclusions from the BIA, facilitated recovery strategy workshop sessions, assessed, current business recovery and disaster recovery capabilities, and recommended enhancements to operations and infrastructure to strengthen recovery capabilities. - Created detail and summary departmental business continuity plans for multiple organizations that were validated and updated through plan testing activities. Developed a governance program designed to keep the plans current and relevant to the related business processes. - Led business continuity and crisis management testing activities that validated the business continuity, crisis management, and disaster recovery plans. Job Update - Houston, TX - Non Local Candidates Encouraged to Apply!!! · Performs accelerated risk assessment and related impact analysis, including the establishment of RTO/RPO. · Drive DR technical solutions design leveraging internal and external partners. Responsible for DR implementation. · Establishes disaster recovery testing methodologies; plans and coordinates the testing of recovery support and business resumption procedures in different functional areas. Assures that recovery procedures are effective for the restoration of key corporate resources and for the resumption of critical business processes. · Provides guidance to and coordinates the efforts of staff members in the development of recovery procedures for key areas of the organization. · Analyzes and identifies points of vulnerability and recommends disaster avoidance and reduction strategies. · Periodically reviews changes in corporate resources with the management of those areas to assure the effectiveness of the recovery procedures and backup capabilities. · Leads the development of IT emergency response procedures. · Conducts disaster recovery training for staff members in all functional areas. Assists in providing instructional and informational materials on emergency response for all roles. Provides guidance in the maintenance of a library of recovery support and business resumption procedures. · Assists recovery support and business resumption staff during a disaster in the implementation of response and alternate operating strategies. Acts as an IT coordinator during an emergency. · Works with vendors of disaster recovery services and facilities; studies and recommends outside services for use during a disaster situation. · Maintains contact with outside organizations participating in reciprocal agreements, whereappropriate. · Prescribes IT DR requirements for new environment, systems and/or facilities. · Provides thought leadership in technology direction, technical services, vendor partnership and industry standards adoption. · Provides coordination across teams to encourage application of standards and adherence to standards based methodologies. · Five (5) years of progressively responsible experience developing, communicating and maintaining DR programs using current techniques and technologies. · Disaster Recovery and/or Business Continuity experience in a Fortune 500 company preferred. · Thorough knowledge and understanding of current disaster recovery planning techniques and technologies as well as the methods used in performing risk analyses and business impact analyses. · The ability to develop a clear understanding of the company's key functional processes and resources. · Excellent communication (written and oral), interpersonal skills, multi-tasking, and time-management skills. To apply to this position please visit http://www.bcmanagement.com/search-jobs.html and enter the job number 2536. To learn more about the position, please contact Alina Howard - BC Management Inc. at ahoward@bcmanagement.com. This master’s degree, CBCP, CEM-certified candidate is seeking a senior position within an organization specializing in business continuity planning/crisis management. With5+ years specializing in the banking, finance/financial services (with regional and global responsibilities) and 10+ years overall experience in the industry, he/she has a strong skill in creating programs from scratch and leading a top-tier industry team into a world-class program. This applicant is willing to travel and is eager to join a company that values excellence in enterprise risk, business resiliency, project management, testing and program execution. BC Management's 2011 study says... that the average total compensation (base + bonus) for a Business Continuity professional based in the USA is $114,180 USD. This data point is a positive indicator that things are beginning to improve with regards to compensations in the business continuity profession. Previous study results going back to 2007 reported an average total compensation for (full-time employee) FTE between $100,496 and $101,554. BC Management's BCM Comprehensive Compensation (Final Findings) Report also highlighted that there are fewer respondents who indicated a total compensation decrease (34.89% in 2011 compared to 40.73% in 2010). This and many other positive economic indicators are highlighted throughout BC Management's leading BCM Compensation Report. Study participants received this world-renowned report as a thank you for their study participation. Haven't received your report? Contact a BC Management for details at info@bcmanagement.com. Next USA BCM Compensation Report will not be published until August 2012. BC Management is delighted to share this information with the business continuity profession. We hope that you see the value in these reports. Please contact a BC Management Representative at info@bcmanagement.com with comments/inquiries. The team of BC Management has extended our exclusive holiday offer to those professionals certified thru ICOR. BC Management is offering you 40% off all BCM Research Reporting from date thru January 31st. An additional 10% off will be extended to those who are active members of the ACP and NEDRIX or who are certified through the BCI, DRI International and ICOR. See Available Reports - http://www.bcmanagement.com/holiday-offer.html. We thank you for your continued business and support and we wish you safe and happy holiday season.